Hello all! Hope you had a good weekend and made it through Monday alright! These are the final weeks of the semester so my projects have slowed down for the moment. I did start repainting my bedroom furniture but am looking for hardware so I will have that post up soon. Anywho, I have two projects to show you today! The first one I finished right after I finished the headboard but I have just been too lazy to post it until now. I think you might remember the chair I bought a while back from a thrift store for a couple bucks! It is quite dated and ugly! It smelled funny too. 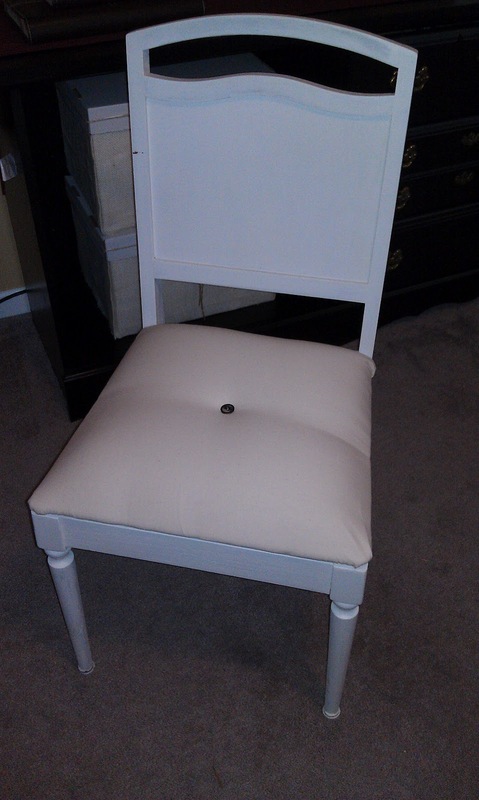 So I painted it white after we moved but had been trying to decide what color fabric I wanted to use for the cushion. I could not figure it out. Well, after I made my headboard I had just enough fabric to double cover the new and thicker cushion. So I stapled it on real quick and ended up with this! I slapped a button on there that I already had and there you have it! My new chair that cost maybe $20 to make! I love it! What do you think? The next little project I have I also put together real quick. 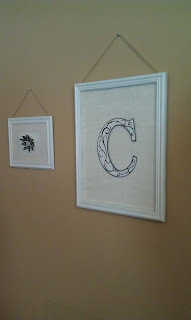 I pinned a monogram project that had a white frame, white letter, and burlap background. I did something similar. 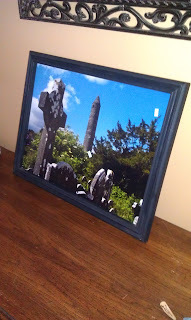 I started with a cheap frame from goodwill. It took a while to find one that was just the frame and big enough. They always charge so much for a frame when it has a picture in it even if its of some ugly ducks or something. Luckily since it was a poster picture and didn't have glass it was only $2. I then turned the picture over and hot glued the burlap to the cardboard. 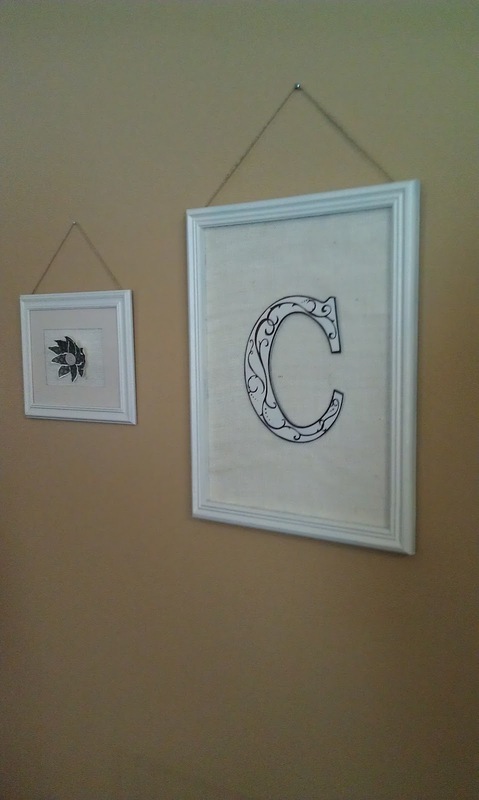 I painted the frame first and the "C". 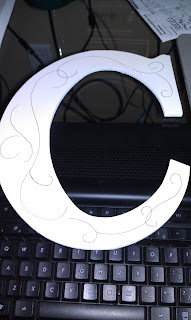 I thought the whole thing was too plain so I decided to draw some stuff on the "C". Here is the final result plus a little frame I did all the same stuff to except made a paper flower for it. This wall is huge and empty! I plan to make a couple more frames with little things like this to fill it. I use pictures on all the other wall we have and keep this one different!